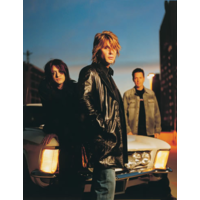 The Goo Goo Dolls is an American alternative rock band formed in 1986 in Buffalo, New York, by vocalist and guitarist John Rzeznik and vocalist and bass guitarist Robby Takac. Since the end of 1994, Mike Malinin has been the band's drummer, a position previously held by George Tutuska. Some of their most popular songs include "Name" from 1995's A Boy Named Goo, "Iris" and "Slide" from 1998's Dizzy Up The Girl, which produced five top-10 singles, and "Here Is Gone" and "Big Machine" from 2002's Gutterflower. The Goo Goo Dolls have 14 top-10 singles and have sold nearly 9 million albums in the United States alone.